Staying physically active is the single most important action we can do to stay fit and independent as we get older. Physical activities are good for our bodies and minds. Also, it help us remain independent and to get the most out of life. Fall is “unintentionally coming to the ground or some lower level and other than as a consequence of sustaining a violet blow, loss of consciousness, sudden onset of paralysis as in stroke or an epileptic seizure”. 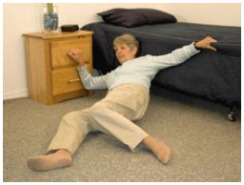 Falls in older people are an increasingly important public health problem. Fortunately there is now evidence to guide fall prevention practice. This will be valuable to medical practitioners, Physiotherapist, occupational therapists, nurses, researchers and all those working in community, hospital and residential aged care settings. This will cover epidemiology, critical appraisal of the roles of exercise, environment, footwear, and medication, evidence-based risk assessment, and targeted and individually tailored falls-prevention strategies. Falls in older people: risk factors and strategies for prevention is a book that Prof. Catherine Sherrington and her colleagues work out. This book is a guide through the maze of falls management. This bridges the gap between highly specialised journal articles and highly recommended to students and medical practitioner. Prof. Catherine Sherrington led the development of novel functionally-relevant exercise protocols for older people which have been demonstrated in 5 clinical trials to have greater benefits on balance and functional ability than traditional programs. Her 1997 clinical trial which was the first to show benefits of a home exercise program after hip fracture has been cited 75 times. To know more about this amazing findings, Professor Sherrington will be at the First Filipino Therapists Conference and Expo, September 24-25, Crowne Plaza, Ortigas Center, Quezon City. For inquires, call Ex-link Management and Marketing Services Corp. at tel. no. 643-3887.